Your beach wedding guests will adore these keepsake seashell favors that are both beautiful and practical. These high quality stainless steel bottle openers have resin handles that are handpainted to look like real seashells. 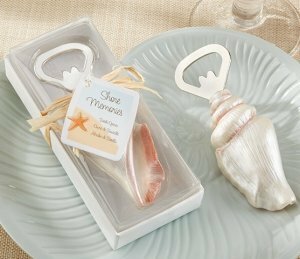 Each of the bottle opener seashell wedding favors comes packaged in a clear gift box that is tied with raffia ribbon and a matching "Thank You" hang tag. Bottle opener measures about 4" long. Hello I was trying to purchase this for a Sea/Ocean Theme Quinceanera, This product will just say Thank you for Coming correct nothing about a wedding? 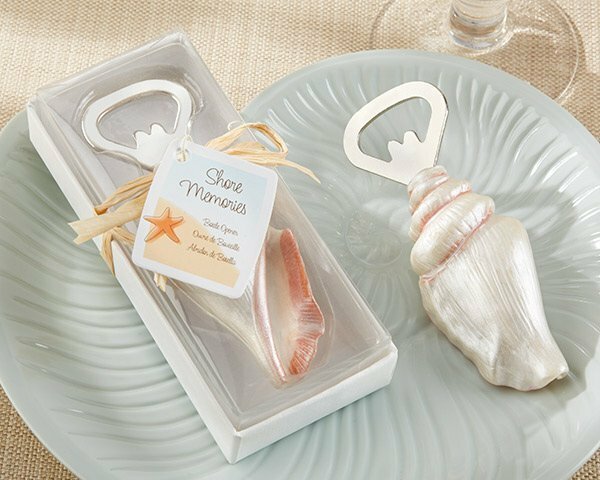 The Shore Memories Seashell Bottle Opener Wedding Favors will say "Thank You" on the hang tag.